An ISO image is an archive file that contains everything on an optical drive. It can be used as a backup file of an optical disc. If you have a pile of DVD discs and want to back them up to your PC, you can try extracting an ISO image from the discs and save the file to your PC as a backup. The ISO image you get from the disc can be later used to burn to a blank disc and create a new copy of the original discs if you need. If you want to copy the DVD with high quality, you are going to need a program that’s good enough to create high quality backups. Among all those choices you can have out there, I would recommend that you give Leawo DVD Copy a shot. The program is a wonderful example of what a great DVD copying program should be. It supports 1:1 lossless DVD backup. It can help you directly copy DVD disc to a blank disc or back them up to your computer as a DVD folder or an ISO image and the latter is what we are counting on for the job. 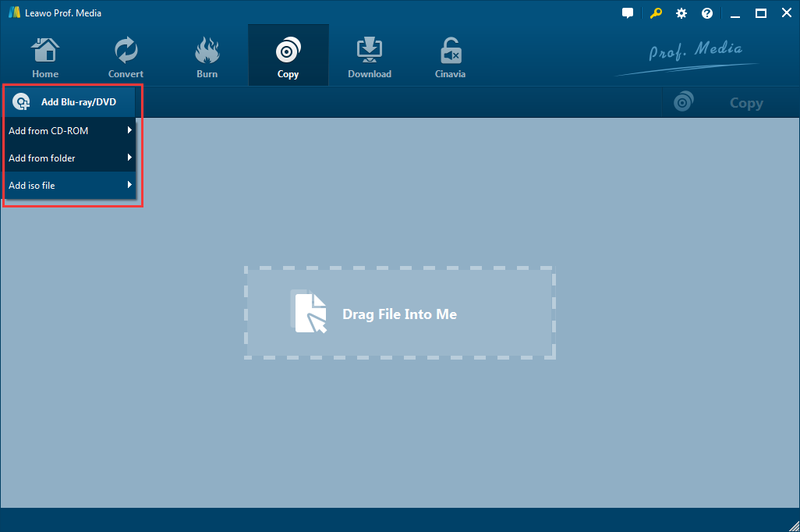 Learn how to make ISO file from DVD disc using the program in the content below. Before we get started, you need to confirm that the criteria below are met. 1. Get a DVD drive if your computer doesn’t feature an internal one. 2. 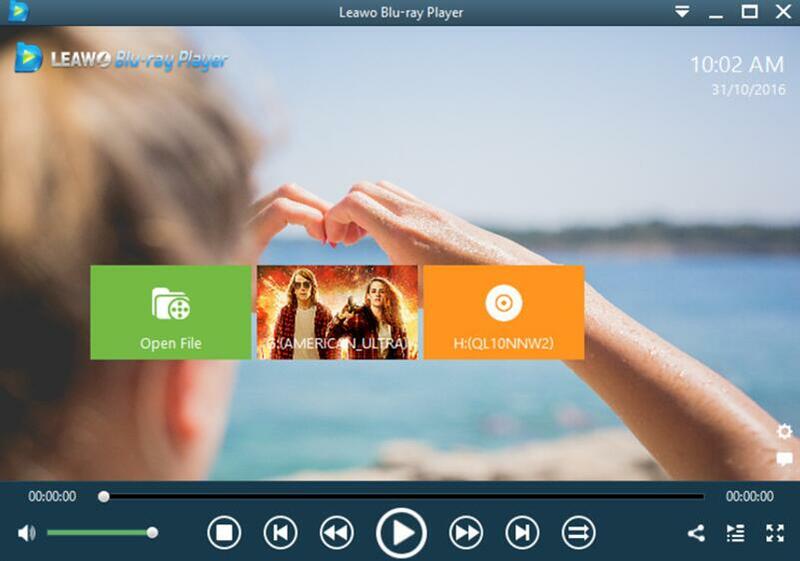 Leawo DVD Copy doesn’t function as an independent program but a module inside Leawo’s Prof.Media software suite. So after downloading and installing DVD Copy on your computer, you will find the Prof.Media icon on your desktop. Learn how to extract ISO from DVD by reading the content below. Step 1. Launch Prof.Media from your desktop and wait for it to finish loading. The DVD Copy icon is on the main interface of Prof.Media. Find it and click on it to open the DVD Copy module. Step 2. Enter your DVD disc into your disc drive in advance. 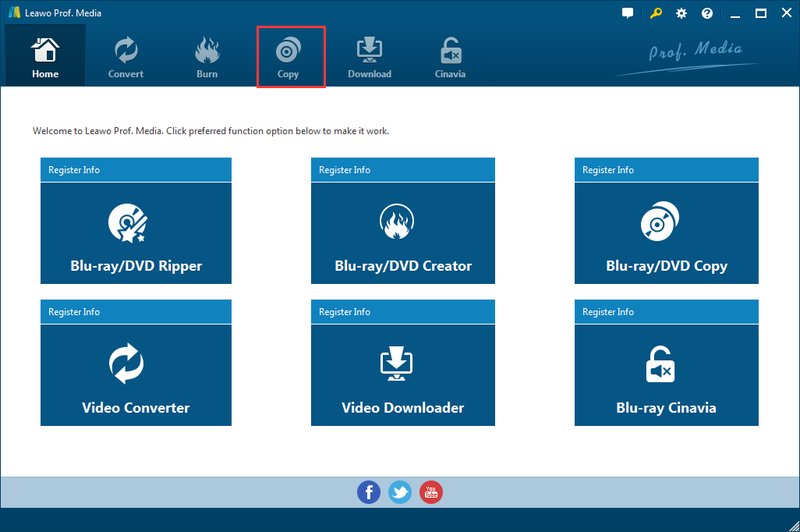 When the program detects your disc, you can use the Add Blu-ray/DVD button to add the content of your DVD disc to the program by hitting Add Blu-ray/DVD>Add from CD-ROM>[your DVD disc]. Step 3. After the disc data are loaded to the program, you will be redirected to the content selecting panel where you need to select the content you want to keep in the ISO image. You have 3 choices: Full Movie, Main Movie and Custom Mode. Full Movie can help you keep all the videos, subtitles and audio tracks in the ISO file. Main Movie only keeps the main movie and one set of audio track and subtitles. Custom Mode enables you to select them manually from the list on the left sidebar. After you are done selecting the content, choose a format to convert the ISO image to in the drop-down menu in the bottom-left. 1:1 lossless DVD copying or DVD-9 to DVD-5 compression are all feasible. Step 4. Notice the Copy button above the video player window? Click that button to display a sidebar above the video player. As we are trying to make ISO file from DVD discs, check the ISO file option on top of the sidebar. You can select a folder to store the output ISO file in the box under Save to. And then start to extract ISO from DVD by clicking the Copy button at the bottom. Make sure that you have a DVD burner to burn the ISO image to a blank DVD disc. Step 1. Import the ISO image to the program by clicking Add Blu-ray/DVD>Add ISO file and selecting it from the Open File window. Step 2. Select the content you need to burn to the new disc by choosing one copy mode from the provided 3 again and select a disc format according to the format of the blank disc. Step 3. Click the green Copy button and this time, check the third option on the top and select the blank disc as the target from the drop-down menu. And then click Copy to start burning the ISO image to the blank disc. With the help of Leawo DVD Copy, you would be able to convert DVD to ISO or burn ISO to DVD discs as you like. It’s a powerful and practical piece of DVD backup software. When creating a DVD copy, Leawo DVD Copy will remove the DVD copy protection as well as the region codes on the disc, thus giving you a copy that can be played on all DVD players. Also, it can directly copy DVD to new DVD discs with no quality loss. It’s a simple and convenient way to create backups of your DVD collection. I’ve heard complaints from friends about how fragile their DVDs are and I’ve always told them to make a backup. The reflective surface of the DVD disc which is used to store media data are extremely fragile, it will require you to handle the disc with extra care. If you don’t pay enough attention when handling them, you might scratch the disc without even realizing it. While you don’t have to worry too much about the slight scratches as most of them won’t actually have any real damage to the data on the disc, you should still pay attention not to leave any deep scratches which can potentially damage the disc and render it useless. And scratches will lead to a lot of playback problems like stops or lags, which would ruin the movie watching experience. If you prefer to watch movies via physical media, no matter if it’s Blu-ray or DVD, always make a backup. With the DVD movie converted into ISO image and stored safely on your hard drive, it gives you the ability to make a new DVD using the ISO image whenever you like when the original disc is damaged or lost. The ISO file you created from a DVD disc can not only be used to create new DVD copies, you can also play the ISO file on your computer. It’s a convenient way to enjoy the movie when you are in the mood for watching one and don’t want to go through the trouble of looking for the disc on the shelf full of different discs. There are two ways for you to watch the movie inside the ISO image. One is to use a video player that supports playing ISO files to play the file. The second way is to mount the ISO image and play it like a regular DVD disc. Here’s a video player that you can use to play an ISO image on your computer directly. The name of the video player is Leawo Blu-ray Player. As you can tell by its name, it’s not a simple video player. This video player supports playing physical media like Blu-ray/DVD/CD as well as videos and audio files in all kinds of formats. And it’s completely. What really sets it apart from other freeware video players like VLC is that it supports playing encrypted and protected commercial Blu-ray/DVD discs. If you use VLC, you should know that VLC can’t play a protected Blu-ray disc unless you have had the needed library and codecs for decrypted the disc installed. But Leawo Blu-ray Player is able to handle the playback of protected Blu-ray discs without needing help from third-party libraries and codecs. 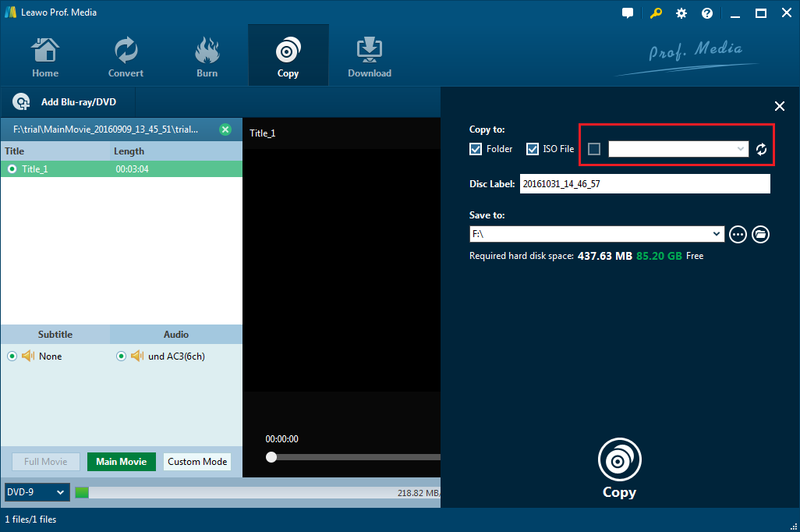 After having Leawo Blu-ray Player installed on your computer, simply drag the source ISO image to it and the program will start playing the movie inside the ISO file automatically. You can also try mounting the ISO file to play the movie within. It’s a little bit more complicated than simply using Leawo Blu-ray Player to play the movie. On different versions of Windows there are different ways of mounting an ISO image. On Windows 7, you will need a third-party tool to mount an ISO image. But on Windows 8 and above, you can directly mount the file with the built-in ISO mounting feature. 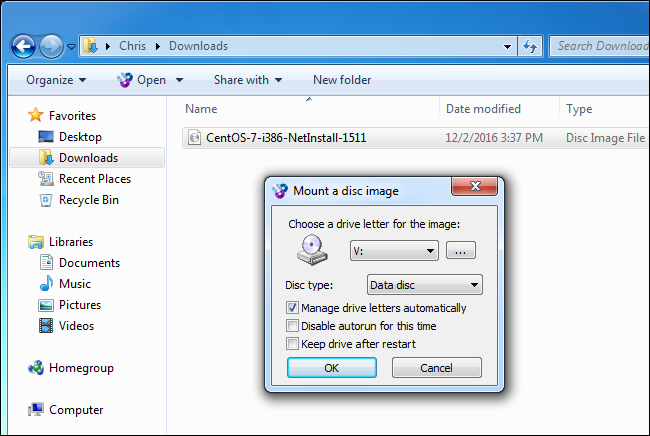 Windows 7 users could try using WinCDEmu to mount an ISO image. It’s a simple and powerful ISO mounting tool that works perfectly on Windows 7. Here’s how to use it. Have WinCDEmu downloaded and installed on your computer. Launch it from the desktop and when it asks for permission to installed the hardware driver it requires, Choose Allow. Afterwards, double-click the source ISO image and there will be a dialog for mounting the disc image. You will see several basic options on the disc. Most of the time you can directly click the OK button to directly mount the ISO image. The virtual drive would appear under Computer after the ISO file is mounted. Just open the virtual drive in the way you open and play a DVD disc on your computer to watch the movie inside. When you are done watching the movie, just right-click the virtual drive and choose Eject to unmount it. If you’ve collected a certain amount of DVD discs, remember to make backups in case the discs are damaged.